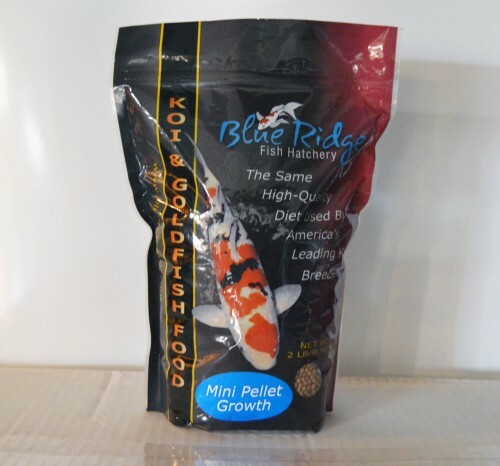 Blue ridge koi and goldfish food is the same food used by blue ridge fish hatchery. America's leading koi and goldfish breeder. Feed your fish these diets and have confidence that they are receiving a nutritionally complete diet that promotes fast growth and maximum health. Color rich contains the same ingredients as the growth food but we've added three proven color enhancers; marigold extract, spirulina, and canthaxanthin. Feed this food for 30 days and watch the reds on your koi and goldfish intensify. available in large pellet only. 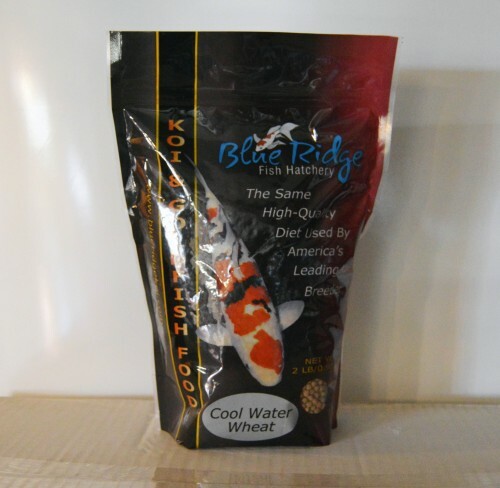 Blue ridge koi and goldfish food is the same food used by blue ridge fish hatchery. America's leading koi and goldfish breeder. Feed your fish these diets and have confidence that they are receiving a nutritionally complete diet that promotes fast growth and maximum health. 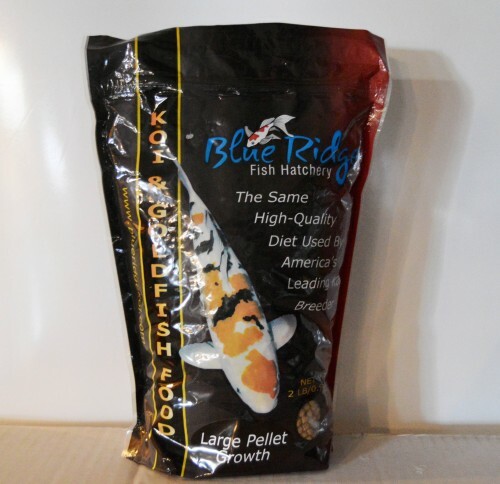 Blue ridge blend mix is mixed for mixed sizes of koi and goldfish. This diet is a blend of the mini and large pellet growth foods. 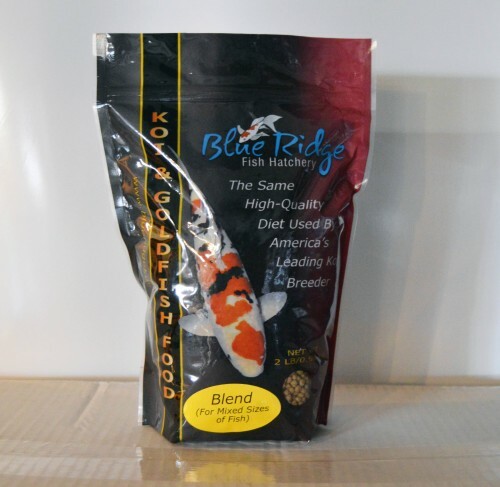 Blue ridge koi and goldfish food is the same food used by blue ridge fish hatchery. America's leading koi and goldfish breeder. Feed your fish these diets and have confidence that they are receiving a nutritionally complete diet that promotes fast growth and maximum health. Large growth pellet for fish over 5 inches. provides a completely balanced nutritional diet that greatly enhances growth in all koi and goldfish. Contains a special blend of vitamins and minerals that promotes resistance to stress and immunity to disease. 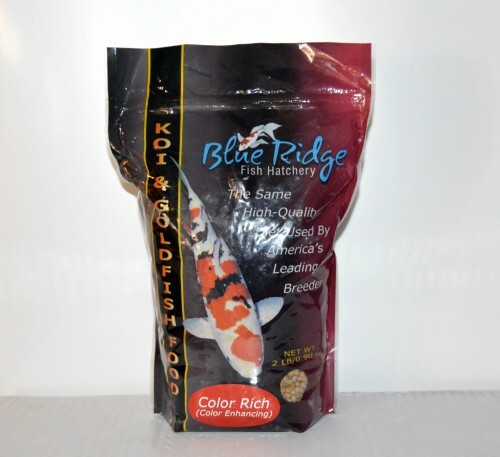 Blue ridge koi and goldfish food is the same food used by blue ridge fish hatchery. America's leading koi and goldfish breeder. Feed your fish these diets and have confidence that they are receiving a nutritionally complete diet that promotes fast growth and maximum health. Mini growth pellet for fish under 5 inches. provides a completely balanced nutritional diet that greatly enhances growth in all koi and goldfish. Contains a special blend of vitamins and minerals that promotes resistance to stress and immunity to disease. 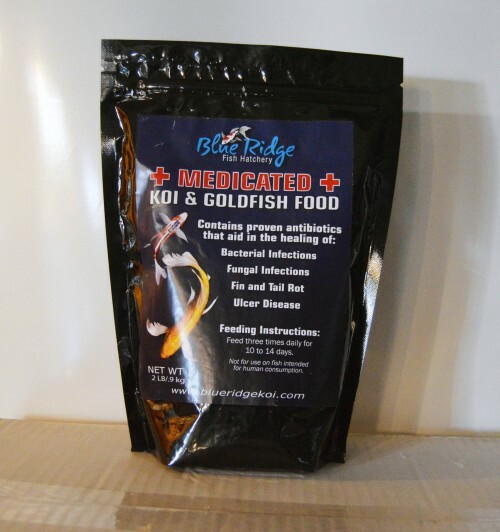 Blue ridge medicated fish food is very effective against bacterial diseases that affect koi and goldfish, including fungus, fin and tail rot, and '' hole in the side'' (ulcer disease). Antibiotics are milled into the food instead of '' top-dressed'' so that fish get the full dose of medication. We've added a generous amount of krill, making it irresistible to sick fish that would otherwise be reluctant to eat. This is the same food used by blue ridge fish hatchery. Feed three times daily for10 - 14 days. Not for use on fish intended for human consumption.